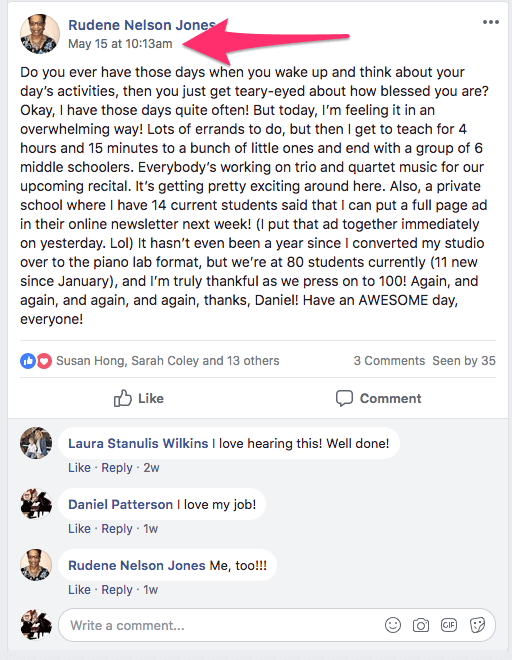 Rudene transitioned from part-time to full-time studio owner…. But something was missing. She desired to create a high-quality group program in her studio. Rudene hired me as a coach to help her convert to a group format. She used my Successful Group Lessons curriculum to structure her marketing and group curriculum. Rudene converted to group format with just a few emails. 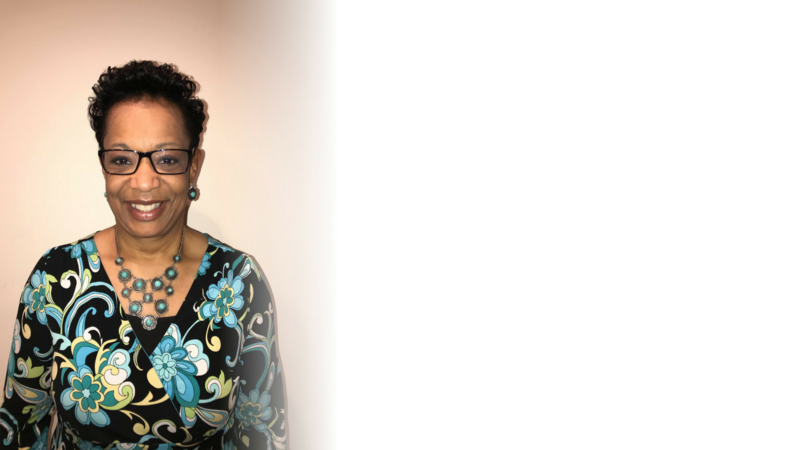 She increased enrollment by 56% during the next school year – while cutting her work hours significantly! 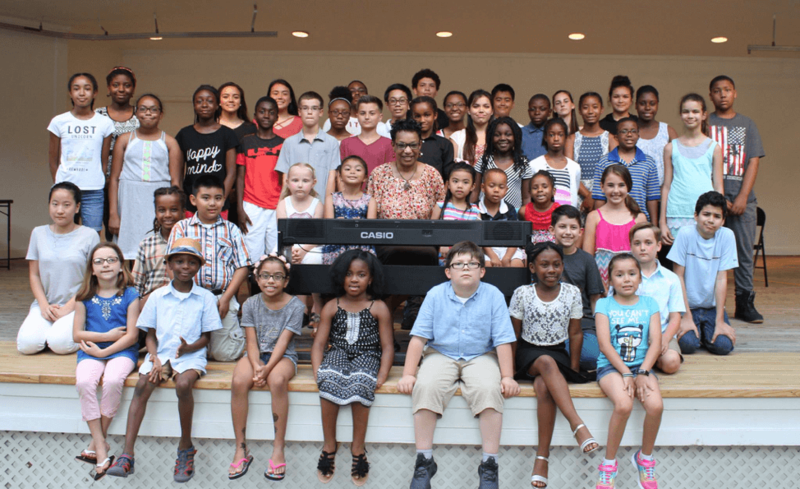 In 2015, Rudene Jones decided that she wanted to transition out of her public school job as a music education teacher. 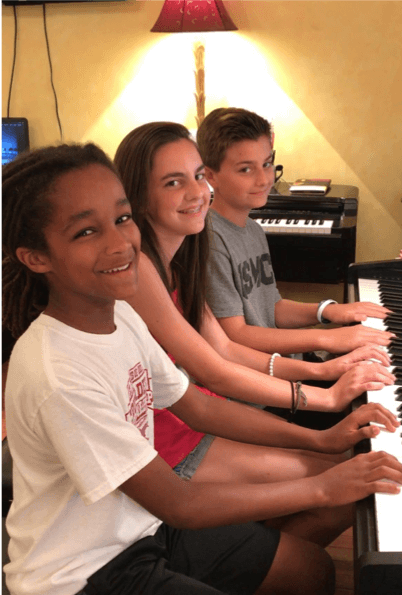 Her desire was to make a living teaching music privately from her home. When she made the leap, she already had quite a few students. The extra time she now had in her schedule allowed her to see more students. But she knew that her income and impact was limited by the narrow window of time she had to see children in the evening. As with most teachers, almost all of her students were only available after school. That’s when she Googled how to start a group lesson program. She read eagerly about how I’ve run groups in my studio for ten years. Rudene felt compelled to contact me, and we spoke for the first time in early March 2017. After a productive phone call, Rudene began working with me. She knew she was in for a challenge… but she was eager to begin! Like many studio owners, Rudene’s biggest fear was that she would have a studio mutiny on her hands. However, she ultimately knew that there was only so much preparation she could do. She needed to pull the trigger. Though she had previously hinted that something new was coming in February of 2017, she did not officially tell people until May. She was ready to begin my three-step process for converting a studio to group all at once. However, she had one more goal that she wanted to achieve… and it was a doozy! POP QUIZ: What’s Harder Than Converting to Group? Here’s the question? 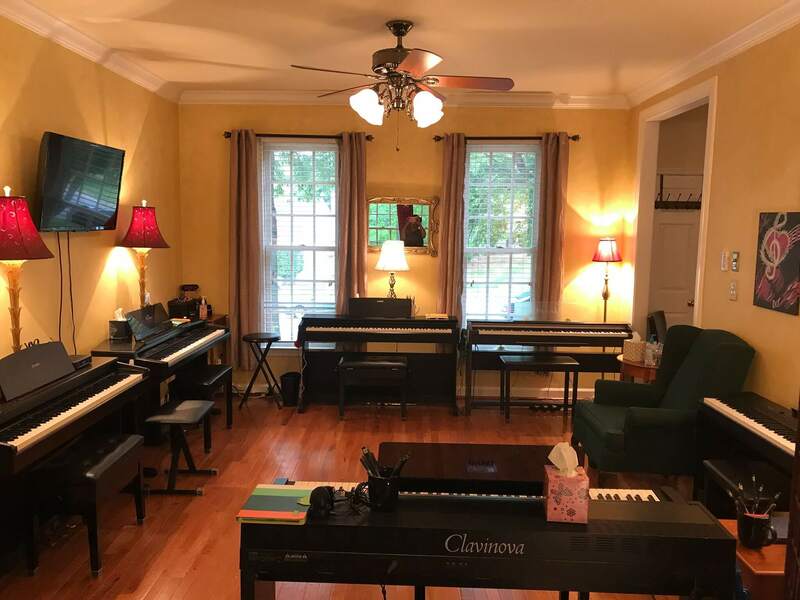 What’s harder than converting a 50-student studio to group lessons? Converting to group and raising rates at the same time! This was the ambitious goal that Rudene set for herself. Her motivation was simple… she knew there were aspects of her studio that needed to change. She wanted to take care of it all at once. And, against my recommendations, she went forward with this plan to raise rates and convert to group. She sent out her announcement emails in early summer… and received an overwhelmingly positive response. Big props to her on her bravery! I asked Rudene to describe the group conversion process from her perspective. I asked her what made it so helpful to her. So, what was that “how to”? 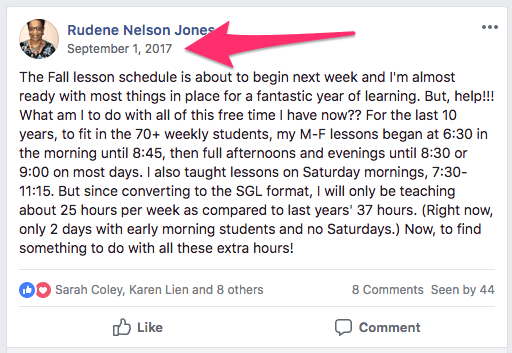 It was Rudene’s idea to start a group program! She was incredibly motivated. But, she got a huge jumpstart on success by using a tested and effective plan, my marketing scripts, emails, and a very different take on how a group should be run. With everyone on board, it was now just a matter of logistics. Setting up her studio, purchasing equipment, and preparing for the switchover in the summer of 2017. What were Rudene’s results? What did she experience as a result of her focused work? She was able to increase her enrollment from 50 to 80 students… while decreasing her working hours! What can you take away from Rudene’s case study? The lessons she learned are applicable to anyone with a studio – big or small, for a new or experienced teacher. Rudene came to our work knowing that she wanted to do group. But – like most teachers – she wasn’t sure exactly how she wanted to run her groups. Thus, she looked at different options that were available for running a group program in her studio. When she saw the format I was teaching, she instantly knew that this was what she wanted. She knew what would be best for her and her students because she had evaluated other options. So, what’s the lesson for you? Look what’s out there. Do your research. Don’t settle for 2nd best. Many curriculums demand that you move your entire group through in lockstep. Don’t settle for that! Don’t leave behind kids who are struggling and slowing the progress of children who could have moved away. Don’t settle for any curriculum that puts limits on your schedule, your goals, and – most importantly – what you can get out of your students. But, the biggest topic we worked on was how to convert the studio. How to increase rates while simultaneously moving kids over to group. Understandably, she had big concerns about these two areas. My observation is that this is normal for most teachers. Every teacher I’ve worked with has had huge fears around these two areas. Believe me… I’ve heard them all! And, I felt many of these same things at one point in time! If you have a persuasive conversion process! Fortunately for Rudene, she converted nearly 100% of her families with the “Magic Emails” that we worked on together. Do group lessons cause headaches for teachers? Is it a discipline nightmare? Sure, you might make more… but is the extra stress worth it? Again, a counter-intuitive truth was revealed to Rudene. She has experienced less stress and more happiness in her career as a result of this switch. These are not empty words. I’m going to let Rudene speak for herself. Rudene has been an active participant in the mastermind for group lessons that I run on Facebook. 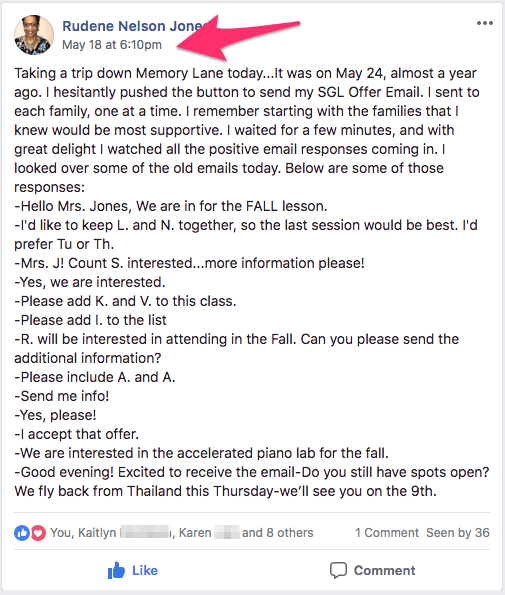 Over the past year, she has posted MANY times about her experience of group lessons. Here is just a sampling of her journey through comments she has left in the Mastermind group. Rudene wanted to teach group. I got the feeling that she was going to make this happen with or without me! She was dissatisfied with much of what is available and being taught about how to do group lessons. This is the reason she came to work with me. It doesn’t mean that she didn’t have concerns! Investment in yourself, in a new program, in new equipment… these an make any business owner second-guess herself! But, in the end, her results have completely quieted her fears and concerns about making the leap into a new format. The changes in her studio, the growth, the new excitement for teaching… all of these have made her enthusiastic about investing in her studio! Grow your studio, attract quality students, raise your rates, and more… what change do you want to make?